UPDATE: The page has been removed. Screenshot above, description below! "Mega Man is back! The newest entry in this iconic series blends classic, challenging 2D platforming action with a fresh look. The stunning new visual style refreshes the series' iconic colorfulness, combining hand-drawn environments with detailed, 3D character models. A variety of difficulty modes makes this the perfect opportunity to experience Mega Man for the first time!" At the moment its hard to say if this is the game's actual release date or a placeholder. Hopefully we won't have to wait too long for an official confirmation – E3 is just a couple weeks away! Red Ash is Comcept, and Mega Man 11 is Capcom; their release dates are completely unrelated, as they are completely different companies, with completely different track records. I think a better game to make fun of Capcom with, in regards to release dates, is Deep Down; Deep Down was announced 5 years ago. However, I don't think developing a (seemingly simple) game like Mega Man 11 compares to something like Deep Down. I'll bet this is the actual release date as of now, since PlayStation Store placeholder dates are almost always 31 December. I don't know where the wiki got a release date for Red Ash, but I'm not even sure it's in Comcept's hands anymore. They merged with Level-5, and Fuze is supplying the funds, so nobody can say for sure what's going on with that game. Not to mention, Inafune's been really quiet over the last three years. 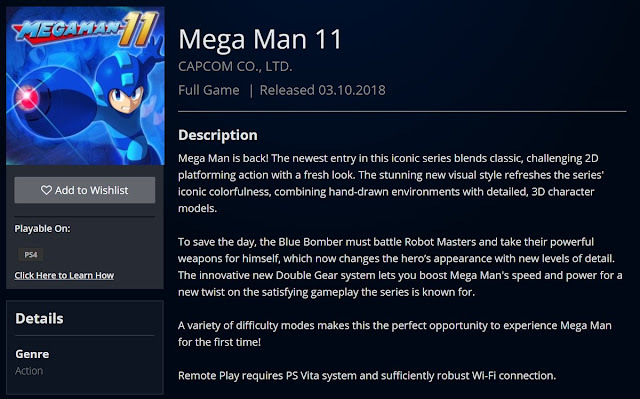 We can probably trust the Mega Man 11 release, though. These leaks have been pretty reliable so far. Time will tell. But, still looking forward to it. About as good as it could be in that month if that's the date. Read Dead 2 and Mega Man might not share much of an audience, but it's still good not to release too close to it as that's all anyone is going to be talking about. That's not a good look, seems like it will be a cheap game that pushes no boundaries and won't be supremely refined and polished but could be wrong. No I don't think it was in development much longer before its 2017 announcement or they'd have more to show in better quality since the three basically stages and few characters and enemies we've seen since. Take my word for it, it's been in development for a good while. Uhh. They have been working on it since early 2016 according to their livestream interview. OK, I guess they are just being right lipped about it in that case. Oh, I believe it, given that Mega Man's symbol in Smash was -a gear-. @AnonymousMay 26, 2018 at 3:20 PM: Yeah because saying things is... *facts*. The power of science. @HyperSonicEXE: You might as well say it was in development a long time cause of Mega Man being blue. I say this cause a concept can preexist and not be the focus of a project directly after its existence, not to mention if it was being developed at the time of Smash's development that would pin it at nearly 6 or more years (cause MM and the gear symbol was developed before the announcement of Smash4, seeing as he was announced with Smash4 at the same basic time)... That would either or both be the slowest most expensive Mega Man game ever developed and it certainly doesn't seem like either from what I've seen and know of it so far. Not expensive if it's jist in planning talks. "Mega Man's going to have a future (one of Sakurai's criteria), gears are going to play a part, etc.". I said I believe it, didn't say ANYTHING about assets, or spending money, or that I know it to be a fact. Very good observation though about the gear icon! "Oh, I believe it, given that Mega Man's symbol in Smash was -a gear-." I… thought that was a Power Battle/Fighters reference, like the Rock Upper. I still think it is, in fact, since the gear has only eight teeth, in Mega Man 11, while his Smash Bros. icon has 12. "I said I believe it, didn't say ANYTHING about assets, or spending money, or that I know it to be a fact. Do not put words in people's mouths." No one said anything about you not believing anything or you saying anything about assets, spending money or what you know to be a fact. It is literally impossible to put words into other people's mouths, what are you even going on about? I'm just worried that the game is only gonna take about an hour to beat like other classic series games. I want a megaman with longevity. MM3 had the right idea with the remix stages and bringing back all of mm2s bosses, but it's still a short game. This is a concern, yes. Added difficulty modes should help a bit, depending on how different they are from each other, but if this series is going to grow at all, Capcom needs to be smart about this sort of thing and pricing. Now if the game has some extra stuff, like the endless modes and challenges from 9 and 10, or if we're real lucky, the level creator of something like Powered Up, that could go a long way towards helping it out. It needs something. A cool surprise would be if after the main game you get 8 new stages with old school bosses or something that are designed around having all the powers. Pretty much anything would be nice so long as the game doesn't get done in small quarter of a day. I thought the MM2 boss rematches were just artificial padding. MM3 just seemed really rushed, like they meant to come up with new bosses, but Capcom wanted the game to hit retail by a certain date, so they gave them all the same skin and just plugged in the MM2 bosses' attack patterns instead. But the length is good, they just need adequate time to develop it. Well here is hoping that much like the legacy collection, they offer a challenge mode to add to replayability. And they are very likely, after the recent survey, going to make Bass and Protoman playable...or perhaps DLC. As the survey put Protoman and Bass in the top spots, with mega man taking 5th place. So it's easy to see Capcom getting at least Protoman back in action. And likely Bass too. If that's the case...the game will gave lots of longevity. Playing the game slightly differently 3 times over and over again will give the game longevity? No wonder Mega Man is small and complacent, fans have the lowest standards. BTW that poll was horsecrap it had Mega Man beat by freaken Roll and Metal Man too, yeah illegitimate. The link has been pulled from the Playstation Store. Ouch. I wonder why it was pulled out...? Also possible, but I could see either. The teeth are too flat to be Metal Blade. Barring that, anything's possible until some dev interviews or an artbook or something tells us which case was correct. Anyway, hoping this plays like 9 - short and sweet, with speed-friendly powers!